As the name suggests, the place was named after a waterfall and dates from the 1870s. During the brief boom in salvaging buffalo hides, the site became a favored stop for the wagons sagging under the weight of bison carcasses. In 1877 a post office was granted to the fledgling community and in just over a decade, the town was booming with essential businesses, including luxuries like a doctor and livery stables. 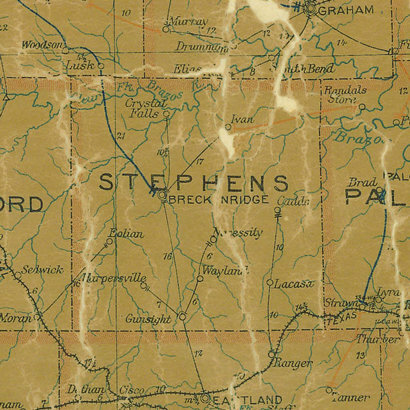 The population was 175, enough to make it the largest town in Stephens County. In 1918 an early oil boom swelled the population to 1,200 and a bank and two restaurants as well as a hotel opened for business. But the paint was hardly dry on the hotel in 1921 when the boom turned bust. Every bank in Stephens County declared bankruptcy except for a single prudent institution in Breckenridge. Crystal Falls got a second chance when it became a stop on the Cisco and Northeastern railroad, but with only a single business left and a skeleton population of a mere 150, the town was hardly in a position to turn things around. 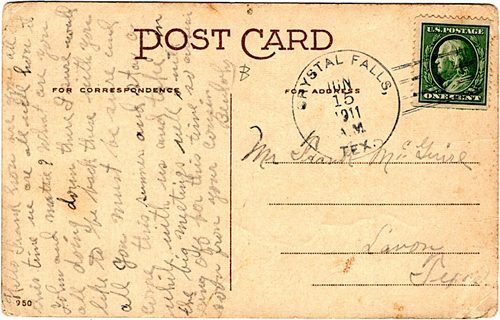 The Crystal Falls post office ceased to be in the early 1940s and the post war search for better paying jobs continued to deplete the population. Only ten people resided there from the 1970s through the 2000 census and that figure may have been inflated. County maps show a cemetery and a church in 1980. It's safe to say the cemeteries are still there, but the fate of the church is unknown as of 2017.